NOTHING LIKE BEING RIGHT ON THE BEACH! ENJOY OUR HOME AWAY FROM HOME. Completely updated 2 bedroom, 2 bathroom ocean front condominium right on the beach. The unit is located on the sixth floor with a million dollar view of the beach from the balcony, master bedroom, living room, and kitchen. We have equipped this unit for a luxury vacation with all the amenities. It is our home away from home. Fully stocked kitchen with crock pot, blender, NutriBullet for frozen shakes or drinks, high-end copper pots, toaster oven, Cuisinart coffee maker with built-in coffee bean grinder (nothing like the smell of fresh coffee). Relax in the large screened balcony that may be accessed from the living room or master bedroom. You can even prepare meals, while you enjoy the spectacular views of the ocean, on the self-standing electric George Foreman grill, yum! The kitchen drawers are upgraded with quiet self-closing mechanisms. Luxury Turkish cotton towels in the bath and for beach side too. The furnishings, mattresses, and linens are all new! There is a television in every room. Large 65" Smart TV with sound system and Blue Ray DVD player in the living area. Another 50" TV in the master bedroom with DVD player and a 37" TV in the second bedroom with Blue Ray DVD player. Cable TV, high-speed internet and a wireless monochrome printer you can easily connect to your laptop if you should need to use it. For your convenience, new full -size washer and dryer within unit and assigned garage parking space. For your use, there are four easy carry back-pack Tommy Bahama beach chairs (each with it's own cooler right behind the chair), 2 beach umbrellas, beach toys and beach games, a compact charcoal BBQ with it's own carrying case you may take to the beach with you.There are also board games and several movies for your entertainment. The complex includes heated pool, sauna, gas BBQ grill, club house, tennis courts, and direct beach access. Just bring your tooth brush!! Patrick AFB is five minutes away for inexpensive retired military shopping. The unit is conveniently located within walking distance of shopping centers...Publix, McDonalds, Dunkin Doughnuts, etc. My name is Deborah and my husband is Rafael. I am a school transformation principal and my husband is retired from 30 years of police work. 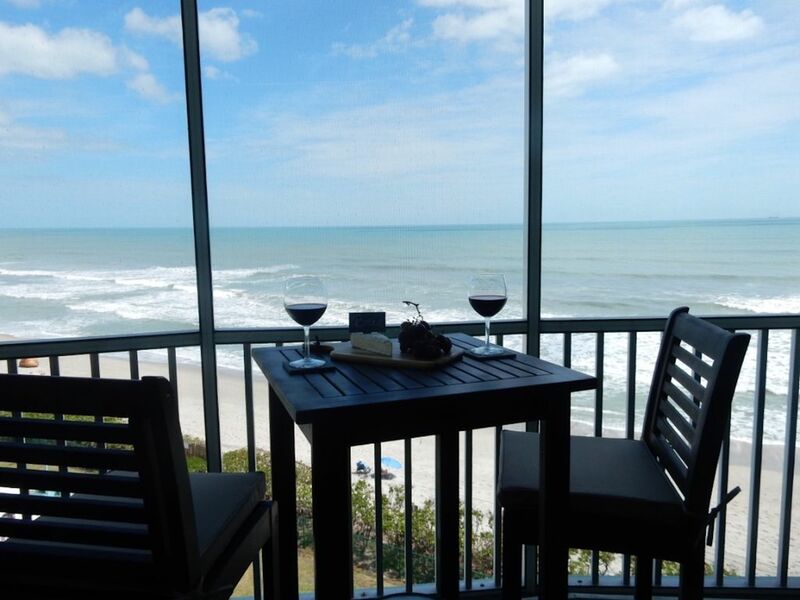 We are the proud owners of this paradise vacation beach front condo. It is our home away from home. We live in Miami, Florida which is approximately a three hour drive from Satellite Beach. We simply love spending time here. We love getting away from the hustle and bustle of everyday life. Being right on the beach and taking in the serenity of waves crashing and the sunsets is priceless. It simply doesn't get better than this. We picked this property because of the convenience the area offers. You are walking distance from Pulblix, McDonalds, Dunkin Doughnuts, Movie Theaters, and so many other places. Also, the food available at the local restaurants is delish! The beach feels like your own private beach. It is not crowed like Cocoa Beach. Yet, if you want to have a fun night out and meet new people, you will be able to do so withing minutes. There are many things to do... local bars, dinners with live music, movie theaters, are only a few minutes away. The property is located less than one hour away from the Orlando theme parks, such as, Disney, Epcot, Sea World, etc. This location offers the best of both worlds. You have the relaxing peace and quite or you may have the fun and excitement. The freedom of choice is yours! There is a land line in the unit for your convenience. Central AC unit. We also have a dehumidifier in the unit since we are directly on the beach. This allows you to control the humidity in the condominium. High-end bedding sheets and throws are provided. New full-size high-efficiency Maytag washing machine in unit. New full-size high-efficiency Maytag dryer in unit. Plenty of uncovered unassigned parking available. One garage assigned parking available. High-speed internet connection. There is also a HP wireless printer in the unit you may easily connect to your laptop if you should wish to print something. High-end luxury plush Turkish towels are provided for baths and beach. Starter toiletries are supplied includes: toilet paper paper towels dish detergent shampoo conditioner soap plus a few extras. Newly fully furnished living area with 65" TV with sound bar and Blue Ray/DVD player. There are two coffee machines. Fresh grinder and coffee brewing for those who love the aroma of great coffee and a Keurig cups brewer for those on the go. Fully equipped kitchen with everything you will need plus more. Kitchen is renovated and is fully equipped. There is a small built-in bar with two stools for breakfast, brunch, lunch or dining. Dinning set accommodates six. It has four swivel chairs and a bench. Seating is counter height for comfort. Basic Cable and high-speed internet. There is a sound bar in the living room. You can use blue tooth to stream music from any of your devices. Blue Ray/DVD player in every room. There are some books in the unit. There are several board games for your entertainment and family fun. Beach toys and games are available for your convenience. Several Movies are available for your entertainment in the unit. Spectacular views from the Balcony! Sauna is located in the pool area. This property is walking distance from shopping centers which include Publix, McDonalds, etc. You will be close to anything you can possibly need. Walmart, Winn Dixie, and Dollar Tree are right down the street as well. Wonderful view of the ocean and well maintained condo. We enjoyed every minute of our 2 month stay. The owners quickly responded to any questions we had before and during our stay. The condo is very nicely decorated, well constructed (we never heard any noise from the surrounding units, and has a lovely screened in balcony where we spent many hours reading books and listening to the ocean waves. Also, the other residents we met were extremely friendly. Easy access to the beach where we took daily walks and convenient to many restaurants. Highly recommend staying here. Great place to stay. Host is flexible with dates and responds quickly. Great View. Clean/Safe Condo. Patrick AFB is located 5 minutes from the property. The famous Orlando theme parks are located about an hour from the property.